I attended the “Practice and Q & A” Philadelphia Union held last Saturday morning for premium seat season ticket holders. Here’s some of what I saw and heard, including observations from Jim Curtin and Earnie Stewart. 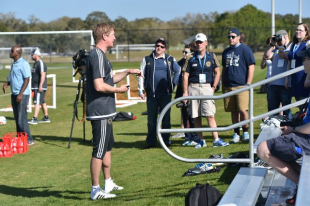 Jim Curtin sketched the structure of a typical practice week. Its rhythm will interest coaches for the timing of the pregame “dialing back.” If the last game was on a Saturday, Sunday is a regeneration day (lactic acid removal for those who exceeded their aerobic capacities at various times in the game). Monday is a day off. Curtin called Tuesday and Wednesday high intensity, high workload days, and Earnie Stewart mentioned them as the times two-a-days occur. Thursday, not Friday, is the easy day, because the sports science people say that’s when it does the most good. And then on Friday there is a short practice with short bursts of high intensity, highly competitive work. It is better to have competed intensely close to game day. Earnie Stewart stated that the team has received no serious offers for Andre Blake. His contacts are aware of Blake, have heard that he is doing well, have mentioned him, but no one has made an actual formal offer. He pointed out that Maurice Edu still shows hints of favoring his leg. My eyes agreed. It was not in the heat of play, but while moving at a relaxed jog during the passing drill that there was still a very slight “hitch” in his “gitalong.” Within the restrictions described above, he looked good. He was playing the center of the field in both the 7 v 7s. Eric Ayuk is back. His head is shaved and he seems to have added chest muscle since the spring. Derrick Jones was a full participant in training. He did not stand out, neither badly nor well. He belonged. Neither Matt Jones nor Tranquillo Barnetta was present on the field. The decisive factor in the Sporting Director’s decision to join the Union project was his visit to the Academy at YSC. All the usual boxes had been ticked positively, but the Academy visit was unique. “Ah Zed,” as a European pronounces “AZ,” had seriously thought about creating an academy, but had thought of nothing like what exists in Wayne. No other academies he had visited compared to Richie Graham’s. There has been much talk of the Galaxy and Red Bulls, but he dismissed their programs as not comparable. When he visited the campus, every academy boy came up to him individually, shook his hand and introduced himself, and welcomed him, all the while looking him in the eye. It was not the content of the program, but the poise and self-confidence of its members that stunned him. The father of two clinched his answer by telling us that his younger child, a shy, diffident 14 year old boy, is going to YSC this coming year, and that he the father is thrilled by the opportunity. He wants that comfort-with-self for his own son. His wife was uncertain, then she visited for herself, and the deal was closed. Stewart described the organization’s scouting process. He pointed out that scouting departments are expensive. He said that the current group totals three. He mentioned that Kyle McCarthy has developed a system of “analytics” which they continue to improve. He named Chris Albright. Whether Stewart himself is the third person, or whether there is an unspecified third party, or even whether Kyle McCarthy is one of his trio, remains unclear. He emphasized that as far as he is concerned, the important thing when putting eyeballs on a player is to watch him practice. He described two basic theoretical models for scouting, each made up of the same components but different in sequence. Conventionally, you see the player, talk to the player and then collect data. Using “analytics,” you collect the data first to identify the player, then you see the player, and last you learn as much as possible about the whole person that might become a player for you on your pitch. “Analytics” hopes to reduce the “needle in a haystack” dimension of scouting. He called the Union locker room chemistry fantastic. Nurturing it and preserving it is very important. Gaining the fullest possible understanding of the human that comes along with the soccer player enables nurturing and preserving both group chemistry and the person. A final thought that comes from direct contact with an impressive “straight shooter.” It develops a comment of his reported earlier elsewhere when Stewart said that Major League Soccer’s style of play most closely resembled that of the Bundesliga, that Eredivisie was less close. It is conventional wisdom that players coming from other leagues go through a noticeable, sometimes lengthy, adjustment period to what MLS demands, both physically and mentally. Before Stewart’s arrival, Tranquillo Barnetta came to the Union from Schalke 04 in the Bundesliga. Without being precise to the exact day, Barnetta has been here one year. A single datum proves nothing. But, how long was his adjustment period, particularly mentally? “Go scout the Bundesliga, please,” said the Union fan. Alberg – About midway through the practice, Stewart called Alberg over to the sidelines and gave him what appeared to be a low-key pep talk. Not a long discussion, but from watching body language (which is always dangerous), it seemed to be effective. Leo – I’ve been a critic of Leo in the past, but I can see why the Union like him. He was very good in the small space drills with keeping/maintaining possession. Scored a couple of goals in the small sided games. Rosenberry – I wish that I had a dollar for every time Curtin said “Good, Keegan!”. Happened a lot, but even at training, you can see how good he is. In the Q&A portion, Stewart marveled at how talented Rosenberry is and how quickly he seems to pick new things up. Edu – He looked good and was an active participant in all of the drills. I was happy to see that. Barnetta – Rode a stationary bike in the River End for much of the practice. First touch – What was interesting is that one of their early drills was a passing one with no defenders and the players hitting medium-to-short diagonal passes. Many of their touches or passes were off which I was surprised by. However, once they moved into the small sided drills and matches where they faced heavy pressure, everyone’s level rose and their techniques improved dramatically. Repeating my comment below to CPfeif, you illustrate the best feature of PSP, wisdom through COLLECTIVE discussion. Four eyes are better than two. Much obliged. Thanks, Tim. I totally agree with you on the collective discussion aspect of PSP, it’s very rare to find nowadays. This is what makes PSP so special. Nice article Tim. I and, I’m sure, many others appreciated the recap. However, as a chemist I have to contend that your explanation of role of lactic acid in muscle fatigue is outdated. The best resource I could point to is a 2008 review article by Allen, Lamb, and Westerblad titled “Skeletal Muscle Fatigue: Cellular Mechanisms”. You illustrate the absolute best feature of PSP, CPfeif, the wisdom created by a COLLECTIVE discussion. I am outdated. My source was the school trainer probably a decade before the turn of the century. I am flattered that you think a 20 years out-of-date has-been humanities guy could follow the chemistry in the Allen, Lamb and Westerblad reference, but I severely doubt my chances unless they were writing for general audiences instead of fellow chemists. Would there be any percentage in you condensing severely and translating? I promise to try to read it. Tim, I think you sell yourself short and would have no problem taking away the important stuff from the article. It is a review article of the topic so it is not very experimental/technical heavy but more historically driven. However, I’m not sure how accessible the article is since I hide behind a university network. A metabolic process called glycolysis is responsible for the processing of sugars (carbs) and can occur both in aerobic and anaerobic conditions. Glycolysis requires a enzyme co-factor abbreviated NAD+. In the process of being used in the process, the NAD+ is reduced (called NADH) which then must be re-oxidized bach to NAD+ to be able to continue the metabolic process. When oxygen is present, this happens by a reaction between O2 and NADH that forms water. When oxygen is not present, this happens by a reaction between NADH and pyruvate that forms lactate (the conjugate base of lactic acid, meaning it is a negatively charged ion and not a neutral species). Traditionally, this lactate and/or acidosis was blamed for both muscle fatigue as well as delayed onset muscle soreness because the two were first linked in a 1929 study by Hill and Kupalov. It was not until the 60s/70s when new techniques to study fatigue were developed, notably a muscle bioposy technique in 1967 and NMR method developed in 1978, that this idea could really be challenged. It took until around the mid-90s but then a bunch of articles disputing the effect of lactate began to be published. The most notable one for me was publisehd in 2001 and is straight-forwardly titled “L(+)-Lactate does not affect twitch and tetanic responses in mechanically skinned mammalian muscle fibres”. Currently, no single cause of fatigue is given, however, current reasons gathering steam are related to neuromuscular junction events, or have to do with the release of Ca+ ions from the sarcoplasmic reticulum that signals the muscle to contract. Additionally, delayed muscle soreness is now believed to likely be caused by micro-tears in the muscle fibers as a result of intense exercise. I’ve now been to two open training sessions this year. And since I look at GKs a lot of the time, one thing has really stood out to me in both sessions. John McCarthy has visibly improved. Now that said, one of his main weaknesses last year was his distribution, so I have not seen much of that aspect. But from what I can see technically, he has gotten very, very good. What a fantastic piece Tim! I’ve been absent from PSP recently and come back to get hit with this wonderful reminder of why I love this site!